I MUST CONFESS being a bit apprehensive when I called Tom Cave last summer. I had a nagging urge to find out from my old boss why Cave Optical Co. had vanished without a trace 14 years ago. It was my good fortune to have been there almost from the beginning, watching the business struggle and grow through its formative years. But the place where my love for astronomy had been gently nurtured now existed only in memory. As a boy of 15 I had built a 3-inch, nonachromatic, f/22 refractor complete with a cardboard tube and wobbly tripod. Through it Mars looked like a tiny daisy with sharp petals, but I was quite proud of my creation. My ignorance of basic optics kept me from getting discouraged. I exhibited my instrument at a hobby show in my hometown of Long Beach, California, where it was seen, with some amusement, by Lou Bellow and Charlie Tarwater -- members of the Long Beach Excelsior Telescope Club. Only much later did I learn that the two were incredibly skilled telescope makers who hadn't had the heart to tell me just how poor my instrument was. Instead they invited me to a club meeting at the home of fellow member Tom Cave. I decided to keep my telescope at home that evening, sparing me great embarrassment as it turned out. I arrived at 265 Roswell Avenue and passed through the gate to the backyard -- and into another world. Before me stood a leviathan of a telescope, so large that it would have taken a 12-foot ladder to reach the eyepiece. But instead an observer's chair was perched on a platform that could be reached by a short ladder. To the right of this monster was a cone-shaped dome, its open slit allowing yet another large telescope to point skyward. Sitting at the eyepiece was Thomas R. Cave Jr., telescope maker extraordinaire and nationally known Mars observer. I had the distinct impression that I didn't belong there. I mustered all my courage and entered the observatory, where several club members were awaiting their turn at the eyepiece. I wondered what they could be looking at since it was still daylight. Cave stepped down. Another member positioned himself at the eye-piece and exclaimed, "Great seeing tonight!" I had never heard the term "seeing" before, though my telescope was too small and aberrated to show its effects anyway. Then it was my turn. I climbed the ladder and peered through the eyepiece. There, surrounded by a deepening blue sky, was Saturn. It wasn't a tiny dot with a barely discernible ring, as I had so often seen it, but a large disk with rings in different shades of yellow-gray, divided into two distinct segments by a jet-black division. I was stunned; I felt deceived, foolish, and embarrassed all at the same time. But that didn't stop me from wanting to see more -- to see it all. After that night I never looked through my telescope again. More than 40 years later I pulled to the curb in front of Cave's old house on Roswell. It looked as it had so many years ago, but Cave had given the house to one of his daughters. He now lived in a two-story apartment built behind the house. Making my way around to the back, I was relieved to see that wonderful observatory still standing after 53 years of service. Its view of the sky was now very restricted, but as a planetary observer Cave would allow nothing to obstruct the ecliptic. Cave greeted me at the door, as mild-mannered and soft-spoken as I had remembered him. His mind was keen and his memory incredible. I knew I was in for a wonderful reunion and would learn at last about the history of Cave Optical. Cave discovered amateur astronomy as an eight year old, and when he was 11, in 1934, he began his first mirror -- a 6-inch f/10 made of plate glass. 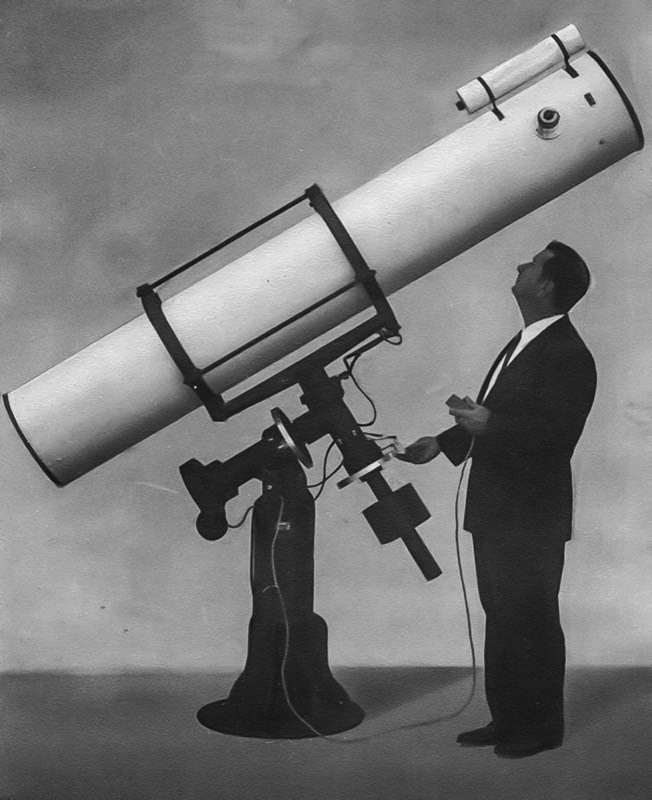 He had plenty of help from the Long Beach Telescope Makers, a club that disbanded in 1939. That experience sealed Cave's future. There was no school where one could learn the optical trade, except perhaps at the University of Rochester, but Cave wanted to acquire the exceptional skill firsthand from a master. After graduating from high school in 1941, Cave found that master in Jimmy Herron. There was no demand for telescope mirrors then, but at the Herron Optical Co. in Los Angeles Cave learned to make everything from complex prisms to many types of lens systems. His optical career was interrupted by World War Ii, but it resumed in 1947, when he spent his days at Herron Optical and evenings at American Optical in Long Beach. Meanwhile, he constructed several telescope mirrors for himself between 1947 and 1950, including the 12 1/2-inch monster I first saw in his backyard. But this was only the beginning Cave's friend Harry Freeman had started a business out of his house in Los Angeles, selling eyepieces and mirrors from Japan along with small secondhand, amateur-made telescopes. Thanks to advertising in Sky and Telescope, Freeman received orders for custom telescope mirrors. He had also worked at Herron Optical but had no experience making mirrors, so he ordered them from Cave. With his optical training and love of telescopes, Cave was one of those rare individuals capable of making a good mirror in those days. When a steady stream of orders began to arrive, Cave and his father saw the future coming. Father and son converted their garage into an optical shop in the spring of 1948. They built simple pottery-wheel grinding machines and constructed modified Draper polishers out of 2-by-4s and pillow-block bearings. By the end of 1950 they had made nearly 500 mirrors for amateurs across the nation. Word of their quality spread rapidly, and orders increased at a surprising rate as amateur astronomy blossomed. 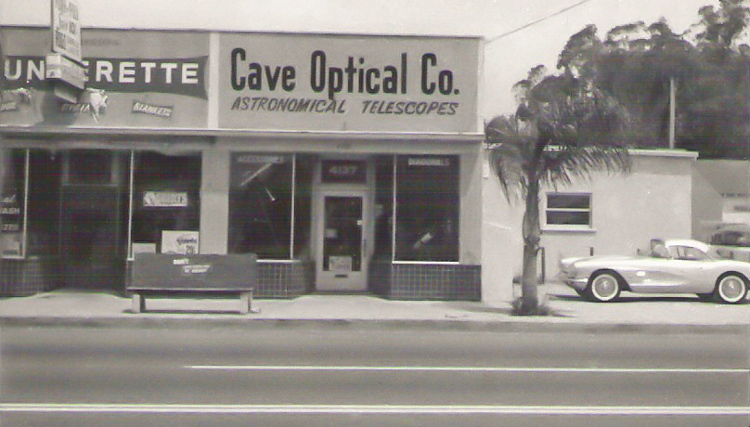 In December 1950 Cave-Wilkinson Optical Co. opened for business on Anaheim Street in Long Beach, though Louis Wilkinson lasted in the partnership only about eight weeks. Cave and his father would go it alone as Cave Optical. Like any new business, this one started modestly. Their first employee was Tarwater from the Excelsior Club. In the beginning he and Cave made all the mirrors, but Tarwater's tenure was cut short when he succumbed to lymphatic cancer at age 41. Cave hired other people as business continued to grow, but it was not easy to find experienced mirror makers. In 1953 one of Cave Optical's finest opticians, Alika Herring, came onboard. The company's reputation for fine mirrors was due in large measure to his magic hands. The summer of 1952 began on a downbeat for me. I had just been fired from a job as a bag boy, and it looked as if my summer would be idle. Then the elder Cave called, saying that Cave Optical was looking for a few kids to help grind some mirrors. I hadn't known that Cave and his father had opened an optical shop 1 1/2 years earlier, but I jumped at the chance. I vividly remember my first day on the job. I knew nothing about mirror making, but I was willing to do anything for the chance to work where astronomy was spoken. I arrived to a friendly greeting from Cave's father, who escorted me to the "back room" (actually there was only one long room, divided into grinding and polishing sections). I immediately spotted a high school chum, Richard Back (future author of Jonathan Livingston Seagull), grinding a 6-inch mirror. Boy, was I upset. He hadn't told me he worked there. After a day or so of cleanup work, Cave thought I was ready to become an optician. He casually handed me an 8-inch mirror blank and told me to grind an f/7 curve on it. I was dumbfounded, never having touched a grinding machine before. But Cave had an incredible talent for reading people and knew I was dying to make a mirror. Fortunately, I had been watching Bach grind his 6-inch mirror on the pottery-wheel machines. 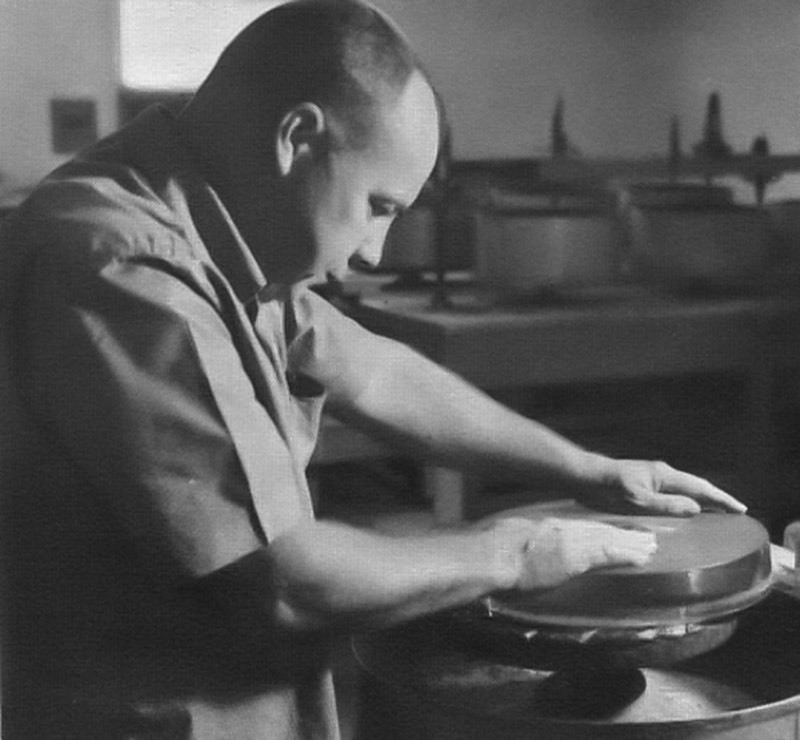 With melted pitch he would stick 1-inch tiles onto a flat glass or metal plate to be used as a grinding tool. Then he would pack it with plenty of #60 carborundum, place the mirror blank face-down on the tile tool, hold his breath, and turn on the machine while holding onto the mirror with all his strength. After a few minutes at 180 r.p.m. the mirror and tool would be broken in or broken. Seconds after I had followed Bach's lead and turned on the machine, the 8-inch blank left my hands and slammed against the side of the grinding tool. With a sickening sound, a large chunk of Pyrex glass broke away from the mirror. My career as an optician was over. Bach looked on, a faint smile on his face. Taking the chipped mirror to the front office, I sheepishly showed Cave the disaster. He looked at it, then at me, then reached under the counter and withdrew another 8-inch blank. He handed it to me with quiet words of encouragement. "You probably should break it in by hand, without turning the machine on until it feels smooth." No screaming. No threats. Cave was my hero that day. I guess it was worth the pain of learning - during my eight-year tenure I would go on to produce more than 600 mirrors. In the first five years Cave Optical was a modest but steadily growing business. Besides making telescope mirrors, the company attracted numerous contracts from the aerospace industry, which we sometimes completed without knowing exactly what we were making. For instance, we made thousands of small glass tubes about the size of straws that had to be ground and polished flat on the ends. Bach and I grew to hate those tubes, but they kept Cave Optical alive during the first difficult years. I found out much later that they were transistor components for guided missiles. 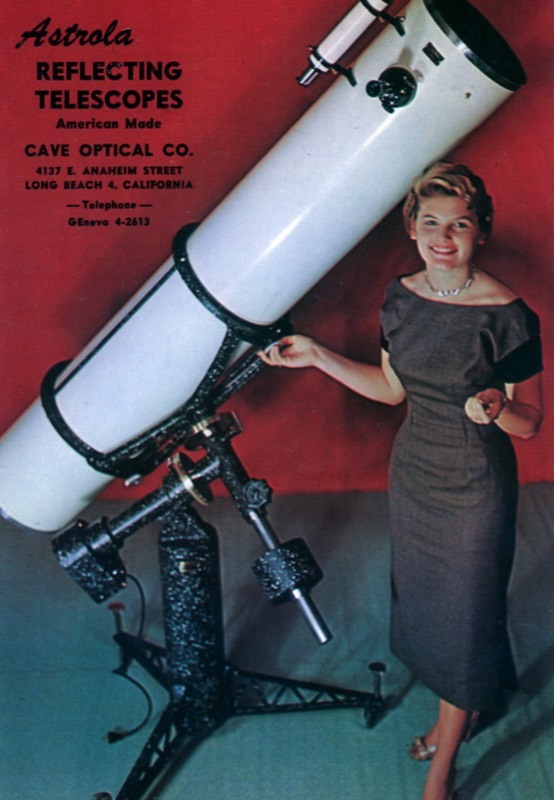 I had worked at Cave Optical for only a year or so when Cave heard that Larry Braymer, who had started a business manufacturing small, high-quality Maksutov-Cassegrain telescopes that he called Questar, was having difficulty with the thin 3 1/2-inch primary mirrors. Braymer had contracted several large optical companies to make them, but all attempts had failed. 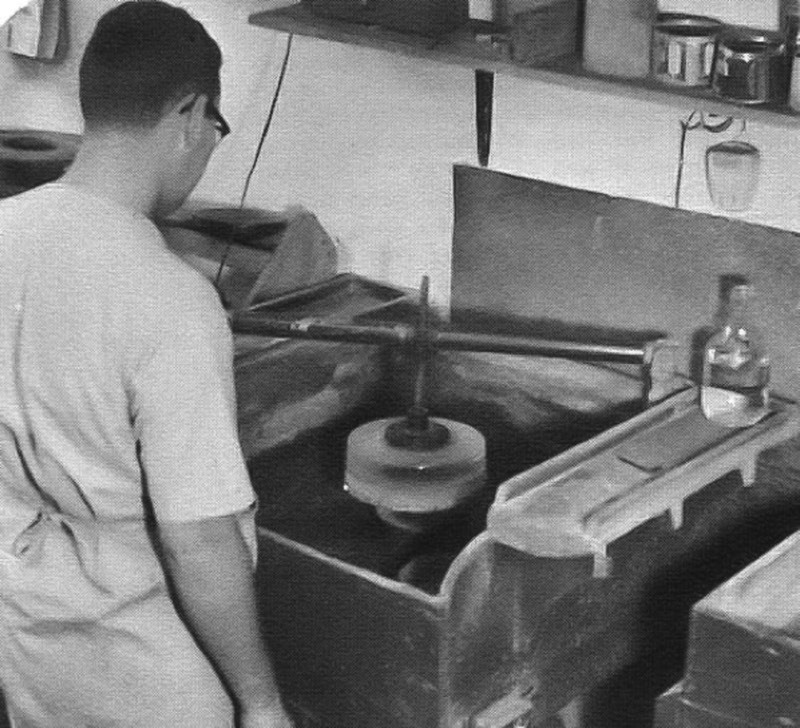 To keep costs low, opticians would grind and polish several of the -inch-thick mirrors at once on a large plate. But removing them from the plate released strains in the glass, causing them to become astigmatic. Braymer had set aside a number of these flawed mirrors, and Cave agreed to work on six of them. Instead of treating them as one large mirror, we put them on polishing machines one at a time and designed a system that would keep stresses to a minimum as they were polished. The results were spectacular clean, sharp images at last. Cave Optical eventually made more than 1,000 of these primaries for Questar. Coffee breaks at the shop were particularly memorable, as this was show-and-tell time. Cave and Herring would discuss their lunar and planetary observations of the night before and compare drawings in a battle of one-upmanship. Herring in particular was a wonderful artist, and his drawings of lunar features became well known in the pages of Sky and Telescope. These morning duels always inspired Bach and me to test our observing abilities against the masters the following evening. I confess that I could never see the marvelous detail our coworkers insisted was there, especially the mythical canals that criss-crossed their drawings and seemed to grow ln number and complexity at each morning session. One day in the middle of one of these breaks, the secretary called Cave to the front office. Although Cave was never harsh or demanding, he returned from there red faced and obviously upset, mumbling something unrepeatable about his father. Cave Sr. ran the business affairs of Cave Optical and was essential to its early success. He also had wonderful handwriting. With a diamond pencil he scribed the Cave Optical signature on the back of each mirror, complete with focal length and mirror number. Each mirror was fine ground flat on the back, clearly distinguishing it from the front. But on that day the eider Cave had blundered: a just-completed 6-inch mirror on his desk bore the beautiful Cave Optical inscription -- on the front! We never let him forget that day. Cave Sr. was a wonderful man. After he passed away just a month before the October 1957 launch of Sputnik 1, the shop was never quite the same. I regret that I did not have him scribe a mirror for me in his Old English style. A thousand mirrors bear his distinctive mark, and lucky is the amateur who has one. 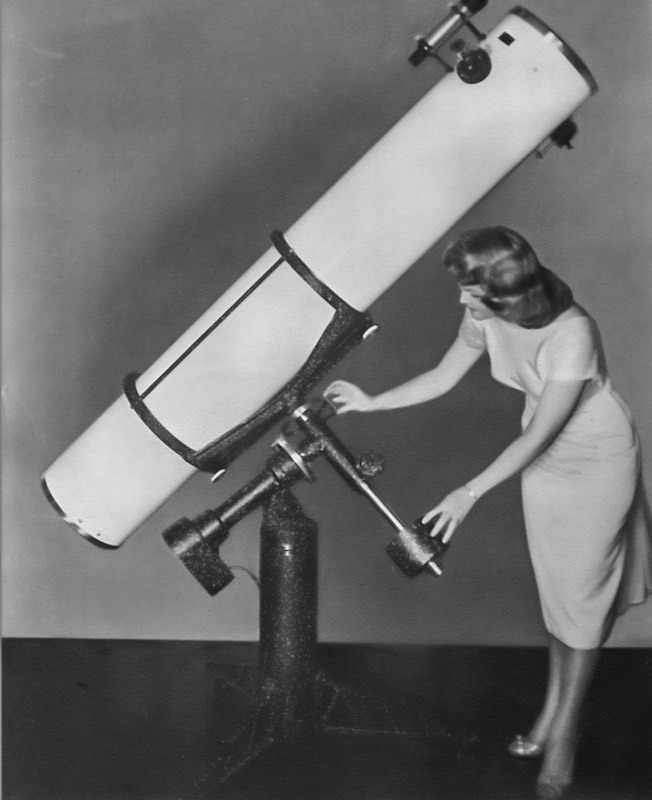 In the early 1950s amateurs who didn't want to bother or lacked the skills to piece together a complete telescope had little choice. Unitron and other Japanese refractors were expensive and limited in aperture. 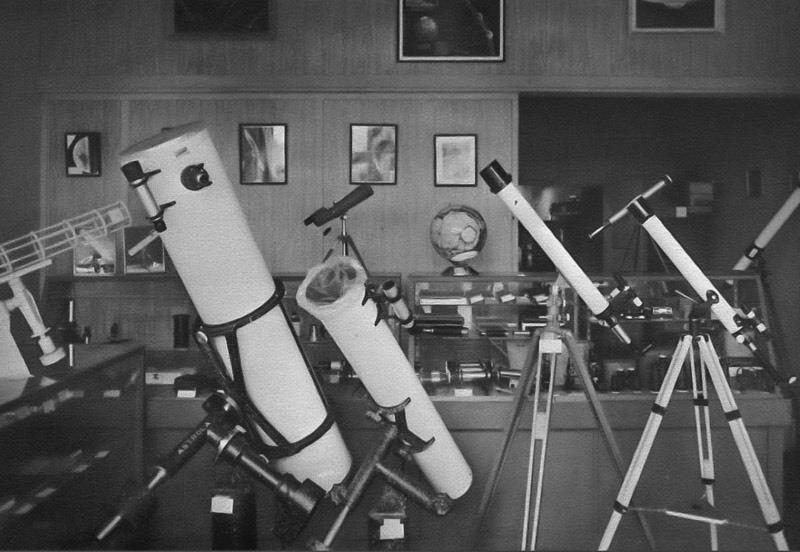 As orders for mirrors arrived from around the world, complete telescopes became an inevitable part of Cave's future. The Newtonian reflector was a wise starting point for the young company. In 1954, Cave designed the first of a long line of Astrola Newtonians. At first, the German equatorial mounts came from Telescopics of Los Angeles. But toward the end of the 1950s demand was so high that Cave doubled the shop's size, creating badly needed space for a clean mirror-figuring room in the process. 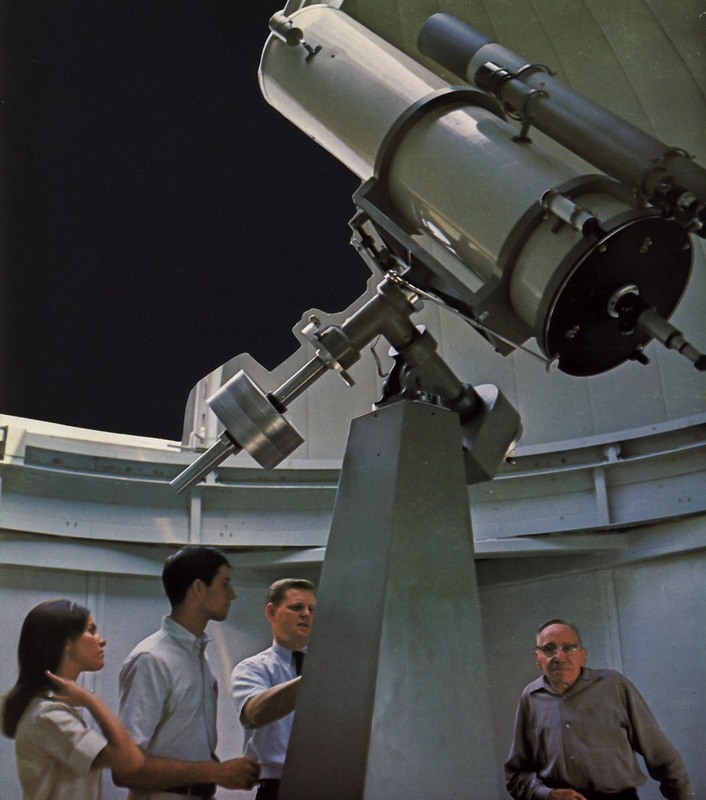 In the mid-1960s another expansion created a complete machine shop and telescope assembly area. For more than a decade Cave Optical enjoyed preeminence in the telescope-making field. Orders poured in, and the company fell months behind filling them. 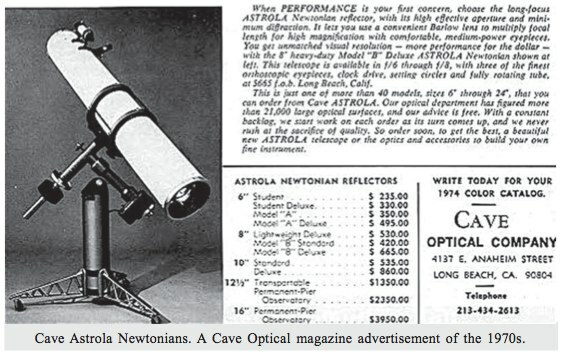 A few competitors also produced Newtonians, but Cave mirrors were the best and the telescope buyers knew it. In 1960, however, just as business was starting to boom, Cave Optical lost its best optician. 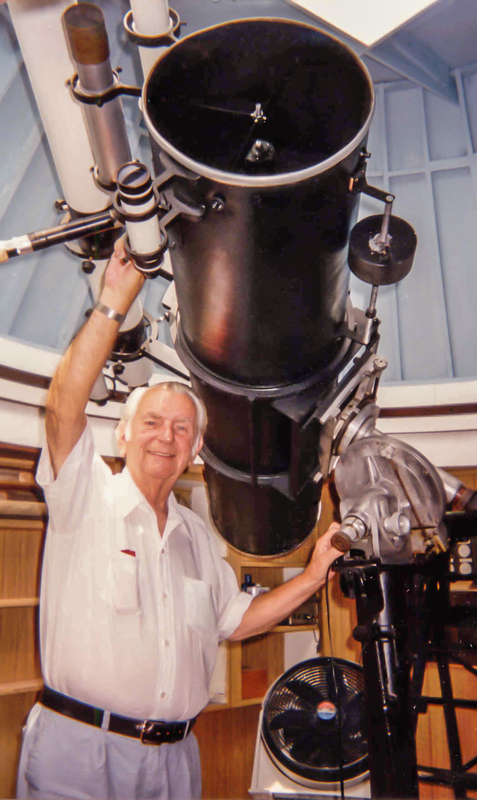 Herring had established himself as an exceptional lunar observer and artist, exactly the rare combination that Gerard Kuiper, director of the University of Arizona's Lunar and Planetary Laboratory, was seeking. Kuiper lured Herring to a new career at the laboratory, where he remained until the observing program was discontinued in 1969. I also left the business in 1960, after obtaining an astronomy degree and entering the planetarium field. The optical training I had received served me well throughout my career. Cave then hired topnotch opticians like Bob Crawford, Ed Beck, and Wait Depampalis, and Herring returned to Cave Optical in 1969 after his stint in Arizona. But by then the telescope market was in a state of change. While Cave Optical was busier than ever, Schmidt-Cassegrains were on the horizon -- Tom Johnson had developed a method of figuring corrector plates that made these catadioptric systems commercially feasible. His new company, Celestron, was destined to compete successfully with Cave and the Newtonians. Yet Cave remained convinced that a good Newtonian could not be beat, especially when it came to planetary observing, and said so in his advertising. But the clientele was changing. Some consumers wanted extreme portability, a feature Newtonians couldn't match over the shorter Schmidt-Cassegrains. Others wanted light buckets: inexpensive, large-aperture systems of very short focal length and simple altazimuth mounts. Dobsonians would eventually satisfy these observers. Cave Optical probably could have competed with these telescopes and the companies that produced them, and it did offer a few Cassegrains. But Cave's heart wasn't in it. Newtonians were his first and only love. A series of unfortunate circumstances led to the company's demise. Cave was always on the lookout for suppliers of telescope accessories. He needed an inexpensive source of eyepieces, finders, and focusers for his Astrola line. In 1972 or '73 John Diebel, an electronics engineer from Hughes Aircraft, offered Cave a deal he couldn't refuse. Diebel imported telescope accessories and small complete telescopes from Japan, and he would supply these to Cave for much lower prices than Cave had been paying. Their business arrangement soon grew into a dose friendship. A driven man, Diebel told Cave that his goal was to be the largest importer of telescope supplies in the United States. He called his business Meade Instrument Co.
As the Japanese yen increased in value relative to the dollar on the world market, the price of telescope accessories steadily rose.. This forced Cave to seek suppliers directly from Japan, bypassing Meade and producing a rift between the two men that never mended. Their relationship became adversarial. But in the meantime, through their association in the early '70s, Diebel had learned valuable information. that might have profited an up-and-coming competitor. In March 1979 Cave became critically ill with a kidney disease, spending weeks in a hospital and even longer convalescing at home. There was no second-in-command at Cave Optical, and his wife, Sylvia, refused to go to the shop to take control. Cave's secretary and chief machinist were left to run the business. But the machinist, along with two or three other key employees, left Cave for Meade, now a fledgling telescope manufacturer. Company loyalties were shattered in Cave's absence. Orders went untilled, and promises were frequently broken. The word on the street was that Cave Optical could not deliver. Orders were canceled, and the company fell into heavy debt. Cave's illness left him in personal debt as well, with $60,000 in medical bills that his insurer refused to pay. He couldn't borrow from the business since most of the available funds were from customers awaiting telescopes, and his 32 employees had to be paid. Much of his personal savings would be needed to pull the company out of its slump. But there was another way out. Before his' illness, Cave had received an offer from Hughes Aircraft of $40,000 per year to reorganize and head their optical department. This was more than he had ever made as president of Cave Optical. But he had been reluctant to give up a business that he had struggled to maintain for nearly 30 years. Eight months later, however, with the job offer still standing, it seemed to Cave the right thing to do. Several potential buyers appeared, including the Swiss group that had bought Celestron from its founder, Tom Johnson. But in 1980 Cave Optical was sold to two English businessmen who had no intention of continuing the operation. They had purchased several small businesses in Britain and the San Francisco Bay area, and now Cave Optical, as tax breaks. The company had been at the forefront of amateur astronomy and in 32 years had provided thousands of people with an economical and convenient means of exploring the heavens. Cave and his workers had produced more than 53,000 telescope mirrors and 15,600 complete telescopes. As a skilled amateur astronomer himself; Cave related to his customers on their own ground. How tragic that, for all of its attributes, Cave Optical should quietly disappear into history as a cold and lifeless write-off. Author Norton, who was employed at Cave Optical in the 1950Rocks from Space was recently published by Mountain Press Publishing Co.
Norton, O. Richard. “Telescope Making: Cave Optical Company.” Sky & Telescope, vol. 88, no. 2 (August 1994). pp 88-93. Reproduced with permission. Copyright Sky Publishing, all rights reserved.